As a little girl I loved to sit in the grass and pick four leaf clovers. I still find them in between the pages of books when I’m reading to my daughter. They fall out, pale yellow and 20+ years old, but still lovely and perfectly flat. Four perfect leaves, reminding me to always believe in magic. It’s one of those treasured memories of being a kid. It’s a gift that runs in our family, the uncanny ability to find four-leaf clovers by the dozen. My poor mom (and my son) can’t find them. My daughter made bookmarks out of them for her birthday party last year. It delights her in the same way it’s always delighted me. Especially when you pick one and give it to someone who’s never found one. Watching their face light up with something so simple and free, it’s a little slice of the easy joy of childhood, there for the finding, if you are so lucky. Nature’s tiny insignificant treasure. A four leaf clover offering you the potential for good luck. It still makes me smile, and I’ve done my fair share of depleting the supply. So I did what comes naturally…. I found a permanent one, by way of my favorite tattoo genius, Melissa. I love it just as much as my many aged treasures tucked in the pages of my favorite books. Floating a few inches off the ground on the perfection of a day spent with my baby girl, my friends and my favorite co-workers. Iced with a kiss. 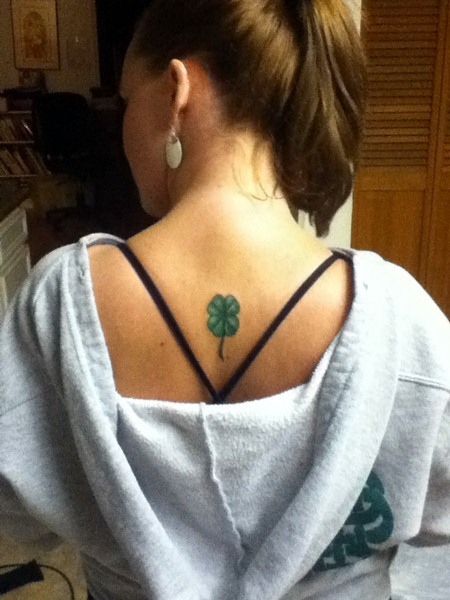 Who has two thumbs and a permanent four-leaf clover? A very lucky girl, indeed. Next Next post: There are men…and there are jerks.